Nigel John Dermot Neill DCNZM OBE (born 14 September 1947), known professionally as Sam Neill, is a New Zealand actor, writer, producer, director, and vineyard owner. Born in Omagh, Northern Ireland, he moved to Christchurch with his family in 1954. Neill first achieved recognition with his appearance in the 1977 film Sleeping Dogs, which he followed with leading roles in My Brilliant Career (1979), Omen III: The Final Conflict, Possession (both 1981), A Cry in the Dark (1988), Dead Calm (1989), and The Piano (1993). He came to international prominence with his portrayal of Dr. Alan Grant in Jurassic Park (1993), reprising the role in 2001's Jurassic Park III. Outside of film, Neill has appeared in numerous television series, such as Reilly, Ace of Spies (1983), Merlin (1998), The Tudors (2007), Crusoe (2008–10), Happy Town (2010), Alcatraz (2012), and Peaky Blinders (2013–14). He has also presented and narrated several documentaries. Neill is the recipient of a New Zealand Film Award and a Logie Award, as well as three Golden Globe and two Primetime Emmy Award nominations. He lives in Queenstown and has three children and one stepchild. Neill was born in 1947 in Omagh, County Tyrone, Northern Ireland, to Priscilla Beatrice (born Ingham) and Dermot Neill. His father, an army officer, was a third-generation New Zealander, while his mother was born in England. His great-grandfather Percy Neill left Belfast in Northern Ireland for New Zealand in 1860, settling in Dunedin. He was the son of a wine merchant importing wine from France. In 1954, Neill moved with his family to New Zealand, where he attended the Anglican boys' boarding school Christ's College, Christchurch. He went on to study English literature at the University of Canterbury, where he had his first exposure to acting. He moved to Wellington to continue his tertiary education at Victoria University, where he graduated with a BA in English literature. In 2004, on the Australian talk show Enough Rope, interviewer Andrew Denton briefly touched on the issue of Neill's stuttering. It affected most of his childhood and as a result he was "hoping that people wouldn't talk to [him]" so he would not have to answer back. He also stated, "I kind of outgrew it. I can still ... you can still detect me as a stammerer." He first took to calling himself "Sam" at school because there were several other students named Nigel, and because he felt the name Nigel was "a little effete for ... a New Zealand playground". Neil's first film was a New Zealand TV movie The City of No (1971). He followed it with a short, The Water Cycle (1972) and the TV movie Hunt's Duffer (1973). Neill wrote and directed a film for the New Zealand National Film Unit, Telephone Etiquette (1974). He was in Landfall (1976). Neill's breakthrough performance in New Zealand was the film Sleeping Dogs (1977), the first local movie to be widely seen abroad. Neill went to Australia where he had a guest role on the TV show The Sullivans. He was the romantic male lead in My Brilliant Career (1979), opposite Judy Davis; this film was a big international success. He made some Australian films that were less widely seen – The Journalist (1979), Just Out of Reach (1979) and Attack Force Z (1981), and appeared in television productions like Young Ramsay and Lucinda Brayford. In 1981 he won his first big international role, as Damien Thorn, son of the devil, in Omen III: The Final Conflict; also in that year, he played an outstanding main role in Andrzej Żuławski's cult film, Possession. Later, he was one of the leading candidates to succeed Roger Moore in the role of James Bond, but lost out to Timothy Dalton. Among his many Australian roles is playing Michael Chamberlain in Evil Angels (1988) (released as A Cry in the Dark outside of Australia and New Zealand), a film about the case of Azaria Chamberlain. Neill has played heroes and occasionally villains in a succession of film and television dramas and comedies. In the UK, he won early fame and was Golden Globe nominated after portraying real-life spy, Sidney Reilly, in the mini-series Reilly, Ace of Spies (1983). An early American starring role was in 1987's Amerika, playing a senior KGB officer leading the occupation and division of a defeated United States. His leading and co-starring roles in films include the thriller Dead Calm (1989),, the two-part historical epic La Révolution française (1989) (as Marquis de Lafayette), The Hunt for Red October (1990), Death in Brunswick (1990), Jurassic Park (1993), Sirens (1994), The Jungle Book (1994), John Carpenter's In the Mouth of Madness (1995), Event Horizon (1997), Bicentennial Man (1999), and the comedy The Dish (2000). Neill has occasionally acted in New Zealand films, including The Piano (1993), Perfect Strangers (2003), Under the Mountain (2009), and Hunt for the Wilderpeople (2016). He returned to directing in 1995 with the documentary Cinema of Unease: A Personal Journey by Sam Neill (1995) which he wrote and directed with Judy Rymer. In 1993, he co-starred with Anne Archer in Question of Faith, an independent drama based on a true story about one woman's fight to beat cancer and have a baby. In 2000, he provided the voice of Sam Sawnoff in The Magic Pudding. In 2001, he hosted and narrated a documentary series for the BBC entitled Space (Hyperspace in the United States). He portrayed the eponymous wizard in Merlin (1998), a miniseries based on the legends of King Arthur. He reprised his role in the sequel, Merlin's Apprentice (2006). Neill starred in the historical drama The Tudors, playing Cardinal Thomas Wolsey. "I have to say I really enjoyed making The Tudors", he said, "It was six months with a character that I found immensely intriguing, with a cast that I liked very much and with a story I found very compelling. It has elements that are hard to beat: revenge and betrayal, lust and treason, all the things that make for good stories." He acted in the short-lived Fox TV series Alcatraz (2012) as Emerson Hauser. He played the role of Otto Luger in the fantasy adventure movie The Adventurer: The Curse of the Midas Box (2014). He had a role in the BBC series Peaky Blinders, set in post-World War I Birmingham. He played the role of Chief Inspector Chester Campbell, a sadistic corrupt policeman, who came to clean up the town on Churchill's orders. In the 2015 BBC TV miniseries And Then There Were None, based on Agatha Christie's thriller, he played the role of General MacArthur. In 2016, he starred in the New Zealand-made film, Hunt for the Wilderpeople, directed by Taika Waititi, as well as the ITV miniseries Tutankhamun. In 2017 Neill appeared in a comedic scene in the fantasy sequel Thor: Ragnarok, in which he portrays an actor playing Odin (as depicted by Anthony Hopkins) alongside Luke Hemsworth and Matt Damon playing Thor and Loki respectively. In 2018, he portrayed Mr. McGregor and also the voice of Tommy Brock in Peter Rabbit. From about 1980 to 1989, Neill was in a relationship with actress Lisa Harrow. They have a son, Tim, born in 1983. Neill subsequently married make-up artist Noriko Watanabe in 1989 and they have one daughter, Elena (born in 1991). Neill separated from Watanabe in 2017, and as of early 2018 was dating Australian political journalist Laura Tingle. He is also stepfather to Maiko Spencer, a daughter from Watanabe's first marriage. In his early 20s he fathered a son, Andrew, who was adopted by someone else. In 2014, Neill said the two "went looking for [one another]" and that their reunion was "much more grown-up" than expected. Neill lives in Queenstown and owns a winery called Two Paddocks, consisting of a vineyard at Gibbston and two near Alexandra, all in the Central Otago region of New Zealand's South Island. His avocation is running Two Paddocks. "I'd like the vineyard to support me but I'm afraid it is the other way round. It is not a very economic business", said Neill, "It is a ridiculously time- and money-consuming business. I would not do it if it was not so satisfying and fun, and it gets me pissed once in a while." He enjoys sharing his exploits on the farm through social media. He names his farm animals after film-industry colleagues. His farming exploits can be seen on his Twitter account @TwoPaddocks. Neill also has homes in Wellington, New Zealand, and Sydney, Australia. He is a supporter of the Australian Speak Easy Association and the British Stammering Association (BSA). He supports the New Zealand Labour Party and the Australian Labor Party. He was appointed Officer of the Order of the British Empire (OBE) in 1991 for his work as an actor. Neill has been appointed a Distinguished Companion of the New Zealand Order of Merit (DCNZM). When knighthoods were returned to the New Zealand Honours System in 2009, those with DCNZM or higher honours were given the option of converting them into knighthoods. He chose not to do this, saying the title of Sir was "just far too grand, by far". He was awarded an honorary Doctor of Letters by the University of Canterbury in 2002. The Games Citytrans CEO Episode: "Transport"
Two Twisted Mick Episode: "Von Stauffenberg's Stamp"
Episode: "To Sam with Love"
2010 Rake Dr Bruce Chandler Episode: "R v Chandler"
Country Calendar Himself Episode: "Film Noir"
^ "Sam Neill in Uncharted territory with new series". New Zealand Herald. 4 August 2018. Retrieved 7 November 2018. ^ Beck, Chris (2 September 2004). "The interview". The Age. Australia. Retrieved 10 December 2007. ^ Condon, Eileen (8 May 2001). "Dishy Sam's got space aspirations; For an actor fascinated by space travel Sam Neill must have thought he'd landed a dream role with his new film, The Dish. The Omagh-born actor talks to Eileen Condon about his latest role". The News Letter. Retrieved 10 December 2007. ^ James Beech (2014-03-04). "Vineyard named in honour of father". Otago Daily Times. ^ Annabel Wilson (2017-11-21). "Obituary: Otago businessman Robert Wilson remembered as food industry pioneer". stuff.co.nz. ^ a b "Sam Neill". Enough Rope with Andrew Denton. Australia. 7 June 2004. ABC. Retrieved 22 July 2010. ^ Erika Grams. "Sam Neill – FAQ". Ibiblio.org. Retrieved 22 July 2010. ^ "Nigel, Neville??". Lexigame.com. 5 October 2007. Retrieved 22 July 2010. ^ a b c d e For Your Consideration: Sam Neill for the FANGORIA Hall of Fame!, Fangoria.com, 11 January 2015. ^ a b "A Cry in the Dark (1988) – Release dates". IMDb.com. Retrieved 14 June 2012. ^ Adam Dawtrey (11 April 2012). "Aneurin Barnard tapped for 'Mariah Mundi'". Variety article. Retrieved 30 July 2012. ^ Catherall, Sarah (28 March 2018). "Lisa Harrow reflects on the pivotal moments in her colourful career". The New Zealand Listener. ^ "Sam Neill's Love Triangle". Woman's Day. 16 October 2017. Retrieved 24 August 2018. ^ Robin, Myriam (4 February 2018). "Actor Sam Neill and AFR political editor Laura Tingle start dating". The Australian Financial Review. Retrieved 13 February 2018. ^ "Sam Neill's Twitter romance gets 'serious'". Spy website, The New Zealand Herald. Auckland. 6 February 2018. Retrieved 13 February 2018. ^ "Sam Neill – Family & Companions". yahoo.com. 10 January 1991. Retrieved 22 July 2010. ^ Wilson, Fiona (2014-10-11). "What I've learnt: Sam Neill". The Times. ISSN 0140-0460. Retrieved 2017-09-24. ^ Scott, Cathy. "Two Paddocks: Our Story". ^ "Let's take a moment to appreciate Sam Neill's beautiful, perfect, pig-filled Twitter account". ^ "Meet Taika, the latest Sam Neill's farm animal with a famous name". Stuff. 4 May 2017. Retrieved 20 February 2018. ^ "Sam Neil's Oamaru Speech". ^ "No. 52564". The London Gazette (Supplement). 14 June 1991. p. 30. ^ "Sir 'just far too grand' for Neill". Otago Daily Times. 1 August 2009. Retrieved 1 August 2009. ^ "Honorary Graduates" (PDF). University of Canterbury. 2014. p. 2. Archived from the original (PDF) on 4 March 2015. ^ Grater, Tom. "Sam Neill joins Daniel Radcliffe in 'Escape From Pretoria'". Screen Daily. Retrieved 8 March 2019. 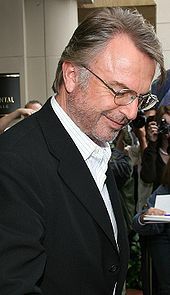 Wikimedia Commons has media related to Sam Neill.